Pharmacogenomic testing identifies individual genetic differences and how they relate to medication response. Genomic markers can be clinically used to personalize medication treatment for each patient. Yet a critical challenge in using pharmacologic treatment for psychiatric disorders is the need to accommodate for the multiple medications patients may be taking since more than 40% of the elderly regularly take five or more concomitant prescription medications.4 Fortunately, the study of all of the potential effects and patient needs has yielded new treatment solutions that already are making a difference for clinicians and their patients. Medication side effect burden has become such an important issue that the Beers criteria were developed to identify potentially inappropriate medications to draw attention to known high-risk medications in this vulnerable population.5 Additionally, antipsychotic use in patients with dementia-related agitation has been associated with an increased risk of death.6 It’s in this context that the doctor-patient alliance assumes the difficult task of weighing the risk of medication side effect burden with the potential benefits of treatment. Pharmacogenomic testing identifies individual genetic differences and how they relate to medication response. Pharmacogenomic information looks at genes relevant in two pharmacologic spheres: pharmacokinetic genomic markers, which are involved in the body’s absorption, distribution, metabolism, and elimination of a drug, and pharmacodynamic genomic markers, which are involved in the drug’s mechanism of action on the body. Both pharmacokinetic and pharmacodynamic genomic markers are used clinically to help personalize medication treatment to each patient. 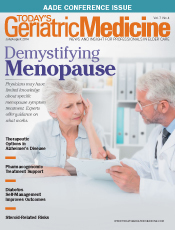 Given the concerns about polypharmacy and side effects, pharmacogenomic information can be particularly helpful in treating aging patients. The metabolizing phenotypes for each CYP gene are derived from the pairing of analogous genes (one paternal chromosome and one maternal chromosome) and range from a poor metabolizer with little or no enzyme activity to an intermediate metabolizer with less-than-normal activity to the extensive normal type to the ultrarapid metabolizer with greatly increased activity. Consider the example of a patient who happens to be a CYP2D6 poor metabolizer and who takes a medication that is a 2D6 substrate, such as nortriptyline. This individual would likely have higher blood levels at normal doses vs. someone who has normal CYP2D6 metabolism, potentially resulting in significant side effects. Conversely, a CYP2D6 ultrarapid metabolizing patient would have more difficulty building up a therapeutic blood level of nortriptyline compared with other patients,7 resulting in lower-than-desired efficacy. Nortriptyline is primarily metabolized by one CYP enzyme; however, most medications are metabolized through multiple genetic pathways, varying by medication even within the same class. When one or more of these pathways isn’t normal for a patient, which is a common occurrence, both efficacy and tolerance are impacted. Prior knowledge of the metabolizing status for each of these pathways can support clinical decisions regarding dosing. Medication dosing for elderly patients can be particularly difficult because of normal changes in their metabolism. Regardless of genotype, typical doses of a medication in an elderly patient can create excessive blood levels of the medication given the normal age-related decline in liver function.11 Additionally, variance in CYP functionality can exacerbate this known age-related effect, creating a multiplicative effect on metabolism. It has been well documented that CYP2D6 poor metabolizers have decreased metabolism of venlafaxine compared with poor metabolizers, intermediate metabolizers, and even extensive metabolizers.12 Waade et al expanded on these findings and reported that elderly individuals taking venlafaxine who were CYP2D6 poor metabolizers had an 18-fold increase in blood levels compared with nonelderly CYP2D6 poor metabolizers, who had a much smaller twofold increase.13 These data suggest what many geriatricians already know: Normal changes in liver function make aging patients more vulnerable. This, in turn, makes the pharmacokinetic CYP variation more pronounced and clinically meaningful. Additionally, in long term care patients, concern for their health often focuses on determining which medication to discontinue. A geriatrician may be consulting on a long term care patient who takes 12 medications and is delirious or has excessive somnolence. Choosing which of the medications to discontinue can be difficult, given that, when prescribed, each medication likely had a reasonable rationale. Pharmacogenomic information may help streamline this process by illuminating which medications have a genetic discordance with a patient and highlighting which ones may be more or less culpable. In the search for effective treatments for resistant psychiatric conditions, clinicians sometimes increase medications above dosing recommendations. Because of the potential genetic interaction in the context of an overall decline in liver function, this practice can be particularly risky in specific elderly patients (eg, poor metabolizers) who haven’t been tested. The increase in dose in a poor metabolizer may push the risk/benefit analysis of a given medication toward more risk, given the age/genotype/medication interaction. Interested clinicians often ask whether they should decrease the dose of a medication if the patient is a poor or intermediate metabolizer or alternatively increase the dose for a medication metabolized by a pathway for which the patient is an ultrarapid metabolizer. These are reasonable adjustments, but a clinician often can utilize the information to skip a metabolic pathway entirely. For example, there’s no standardized dosing schema specifically for CYP2D6 poor metabolizers taking venlafaxine. For the minority of patients who are 2D6 poor or ultrarapid metabolizers, it can be advantageous to circumvent this anomaly in metabolism by instead prescribing desvenlafaxine, which isn’t metabolized by CYP2D6, thus narrowing the dosing variation and reducing uncertainty in this important treatment variable. In addition to pharmacokinetic information, clinically relevant variations have been identified in pharmacodynamic genes. The gene encoding the serotonin transporter has two major promotor variations that affect the protein. In three meta-analyses, the short allele variant appeared to be less active and thus confer poorer response to selective serotonin reuptake inhibitors than the long variant for major depressive disorder.14 With the short variant as a predictor of poor response, many authors have suggested targeting other pathways for treatment in these individuals.15 Other pharmacodynamic genes that are important in predicting efficacy or side effects in various psychiatric disorders include HLA-B, COMT, HTR2A, ADRA2, and OPRM1. One of the traditional barriers to the adoption of pharmacogenomic technology is translating complex genetic information to physicians and other practitioners. Physicians often feel as though they need to learn an entirely new field of “genomics” to utilize pharmacogenomic testing information, and it can be daunting to begin implementing pharmacogenomic concepts in practice.16 Medications have varying levels of affinity for the pharmacokinetic and pharmacodynamic gene products, which can create confusion about how to utilize the information provided at the point of care. One common and important illustration of this translational problem is the tradition in the pharmacogenomic literature of calling normal phenotypes “extensive” metabolizers, which has led to specious clinical dosing decisions when misunderstood. Additionally, many medications have more than one metabolic pathway, which makes interpretation of the pharmacogenomic testing difficult unless multiple variables are considered synchronously. It’s difficult for a clinician to attempt to account for multiple genes interacting with multiple metabolic pathways and effector proteins without access to some form of integrated laboratory information. To address this important analytics problem, the GeneSight Psychotropic test has been developed to provide practicing clinicians with a suite of preselected psychiatric genes, yielding a composite phenotype that integrates with the known pharmacology of each medication. This combinatorial approach accounts for both single and multiple metabolic pathways as well as pharmacodynamic considerations for each medication. GeneSight includes pharmacokinetic and pharmacodynamic genes that address both the safety and efficacy of psychiatric medication. This medication stratification process categorizes antidepressant and antipsychotic medications into three color-coded categories for each genotyped individual: little or no gene-drug interaction (green “use as directed” bin); moderate gene-drug interaction (yellow “use with caution” bin); and severe gene-drug interaction (red “use with caution and with more frequent monitoring” bin). Additional information is supplied to clinicians through the use of drug-specific footnotes for those medications in the yellow and red advisory categories, providing the details of the gene-drug interactions. Genotype and phenotype results with interpretive comments for each of the genes provide a further level of detail. This layering process allows for complex genomic and pharmacologic data to be presented in discrete, increasingly informative layers to address the translational problem and provide useful clinical insight. GeneSight pharmacogenomic testing has demonstrated improved efficacy over the treatment-as-usual empiric approach to medication selection for major depressive disorder in three clinical trials.17-19 The larger LaCrosse and randomized controlled Pine Rest trials further demonstrated clinical validity by showing that individuals in the blinded, treatment-as-usual arm (ie, nonpharmacogenomic arm), who would be predicted to have the most severe gene-drug interactions (red bin), did indeed have the worst outcomes compared with those who had moderate or no gene-drug interactions (yellow and green bins). The addition of a priori combinatorial pharmacogenomic information in the GeneSight arm of both studies showed the greatest improvement, specifically in those individuals who were on a red bin medication because the clinician changed the medication or dosed it with regard to the known gene-drug interaction. Improved efficacy is an imperative clinical benefit of pharmacogenomic information. However, in an era of double-digit expansion of medical costs, the economic benefits are increasingly important as well. Improved outcomes with decreased costs has become the mantra for those seriously interested in improving our health care system and promoting wellness. With mounting clinical evidence regarding efficacy and economic outcomes, a critical mass is building to implement pharmacogenomic testing routinely for patients who may benefit, especially vulnerable populations like the elderly. We’re now in an era where informed clinicians can utilize pharmacogenomic knowledge as a part of a comprehensive treatment plan to support care for their patients. Over the next few years, the appropriate use of pharmacogenomics likely will be addressed in practice guidelines and become a routine part of clinical care. Given that the current strengths of pharmacogenomic testing align directly with the common pharmacologic challenges in the elderly and the need for better outcomes with lower costs, the aging population may be the first large group of individuals to benefit from a paradigm shift in treatment with integrated pharmacogenomic testing. Many families currently are dealing with the vagaries of psychiatric illness in someone about whom they care deeply. Pharmacogenomic information now is available to help improve the trial-and-error approach and support patients in their path toward wellness. — Joel Winner, MD, is president of Winner Psychiatry in Boulder, Colorado, and medical director of Assurex Health in Mason, Ohio. He is also an assistant clinical professor in the University of Hawaii department of psychiatry. For more information, go to www.genesight.com. 1. Geriatrics and mental health — the facts. American Association for Geriatric Psychiatry website. http://www.gmhfonline.org/prof/facts_mh.asp. 2. Older adults and mental health. In: US Department of Health and Human Services. Mental Health: A Report of the Surgeon General. http://profiles.nlm.nih.gov/ps/access/NNBBHS.pdf. Published 1999. 3. Worthington B. Elder suicide: a needless tragedy. Today’s Geriatric Medicine website. http://www.todaysgeriatricmedicine.com/news/exclusive_03.shtml. Accessed June 24, 2014. 4. Gu Q, Dillon CF, Burt VL. Prescription drug use continues to increase: US prescription drug data for 2007-2008. NCHS Data Brief. 2010;(42):1-8. 5. American Geriatrics Society 2012 Beers Criteria Update Expert Panel. American Geriatrics Society updated Beers criteria for potentially inappropriate medication use in older adults. J Am Geriatr Soc. 2012;60(4):616-631. 6. Schneider LS, Dagerman KS, Insel P. Risk of death with atypical antipsychotic drug treatment for dementia. JAMA. 2005;294(15):1934-1943. 7. Dalen P, Dahl, ML, Bernal Ruiz ML, Nordin J, Bertilsson L. 10-hydroxylation of nortriptyline in white persons with 0, 1, 2, 3, and 13 functional CYP2D6 genes. Clin Pharmacol Ther. 1998;63(4):444-452. 8. Package insert: Abilify (aripiprazole). Otsuka Pharmaceutical Company website. http://www.otsuka-us.com/Documents/Abilify.PI.pdf. 2013. Accessed June 18, 2013. 9. Package insert: Celexa (citalopram hydrobromide). Forest Pharmaceuticals website. Revised November 2013. Accessed August 30, 2013. 10. Conrado DJ, Rogers HL, Zineh I, Pacanowski MA. Consistency of drug-drug and gene-drug interaction information in US FDA-approved drug labels. Pharmacogenomics. 2013;14(2):215-223. 11. Maletta GJ. Pharmacotherapy in the Elderly. In: Agronin ME, Maletta GJ, eds. Principles and Practice of Geriatric Psychiatry. 2nd ed. Philadelphia, PA: Lippincott Williams & Wilkins; 2011. 12. Shams ME, Arneth B, Hiemke C, et al. CYP2D6 polymorphism and clinical effect of the antidepressant venlafaxine. J Clin Pharm Ther. 2006;31(5):493-502. 13. Waade RB, Hermann M, Moe HL, Molden E. Impact of age on serum concentrations of venlafaxine and escitalopram in different CYP2D6 and CYP2C19 genotype subgroups [published online May 27, 2014]. Eur J Clin Pharmacol. 14. Licinio J, Wong ML. Pharmacogenomics of antidepressant treatment effects. Dialogues Clinical Neurosci. 2011;13(1):63-71. 15. Kung S, Li X. The clinical use of pharmacogenomic testing in treatment-resistant depression. Primary Psychiatry. 2010;17(5),46-51. 16. Winner J, Goebert D, Matsu C, Mrazek DA. Training in psychiatric genomics in residency: a new challenge. Acad Psychiatry. 2010;34(2):115-118. 17. Hall-Flavin DK, Winner JG, Allen JD, et al. Utility of integrated pharmacogenomic testing to support the treatment of major depressive disorder in a psychiatric outpatient setting. Pharmacogenet Genomics. 2013;23(10):535-548. 18. Hall-Flavin, DK, Winner JG, Allen JD, et al. Using a pharmacogenomic algorithm to guide the treatment of depression. Transl Psychiatry. 2012;2:e172. doi: 10.1038/tp.2012.99. 19. Winner JG, Carhart JM, Altar CA, Allen JD, Dechairo BA. A prospective, randomized, double-blind study assessing the clinical impact of integrated pharmacogenomic testing for major depressive disorder. Discov Med. 2013;16(89):219-227. 21. Allen J, Carhart JM, Spivak A, Dechairo BA. GeneSight Psychotropic reduces overall medication cost in patients treated with psychiatric medications. Poster presented at: American Psychiatric Association 167th Annual Meeting; May 3-7, 2014; New York, NY.